Removing the DVD tray is a cold-service operation. You must power off the server before you remove the DVD tray. 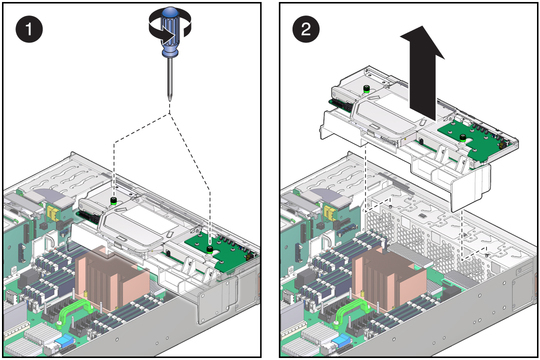 If you are removing the DVD tray as part of another component's removal or installation procedure, go to Step 2. See Remove the DVD Drive. Disconnect from the DVD tray the power cable and the signal cable connected to the signal interface board. Fully loosen the two captive screws from the DVD tray (pane 1). Slide the DVD tray rearward and lift it out of the chassis (pane 2). Set the DVD tray aside. If you removed the DVD tray as part of a replacement operation, install a new DVD tray. See Install the DVD Tray. 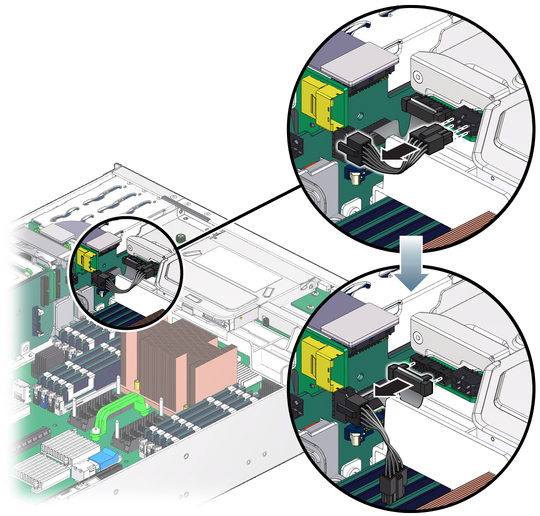 If you removed the DVD tray as part of another component's removal or installation procedure, return to that procedure. See Component Service Task Reference for assistance.